The hardest substance in the body is found in the teeth, the enamel. In fact, tooth enamel is as hard as steel! Unfortunately, despite their durability, our teeth can still become damaged. We might be surprised at how vulnerable our teeth are to damage caused by accidents, neglect, or even to diseases. That’s why at Ria Family Dental, our goal is to not only help you achieve healthy teeth but also to help you protect them for life. You don’t have to say “No!” to fun. With custom-fitted mouthguards from Ria Family Dental, your pearly whites are protected from damage, so you’re always ready for your group pictures! A mouthguard is made of poly (vinyl acetate-ethylene) copolymer clear thermoplastic; polyurethane; and laminated thermoplastic, making it strong and flexible at the same time. Many people think that only professional athletes should wear mouthguards. This is not true. In fact, children or those who are sports neophytes need them the most since they are still learning and may be clumsy. Wearing a mouthguard shields your teeth and soft tissues from the forceful impact. It absorbs and cushions the blow, therefore protecting your pearly whites. 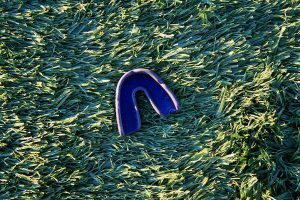 Choosing the right mouthguard is as essential as wearing them. There are mouthguards available in drugstores, however we strongly advise against buying them. Drugstore mouthguards are stocky and made of materials that do not adjust to your movements. They are not custom-fitted to you so they can easily fall out. They are also uncomfortable and hamper speaking. Enjoy your sports activity without worrying for your pearly whites. With custom fitted mouthguards at Ria Family Dental, your smile is safe from accidental damage. Get your custom-fitted mouthguards today!